Home » Posts Tagged "Ephraim lodging"
It’s definitely fall. The days are warm, the nights are cool and the leaves are glorious. Autumn is one of the best times to check out Door County and take in its scenic beauty. When looking at Ephraim, WI lodging choices, the comfortable rooms at Bay Breeze Resort are an ideal place to set down some roots, relax and enjoy your stay. While the trees are full of color, they are also full of apples. The apple season continues for the next few weeks and there are several places in the area to buy freshly-picked apples or homemade apple goodies. There are also a few orchards that allow people to pick their own apples, too. October also means pumpkins and the Egg Harbor Pumpkin Patch celebrates all things pumpkins on Oct. 11-12. This fun, free event features live music, carnival rides, arts and crafts vendors, face painting, pumpkin and scarecrow displays, kids’ games and activities, foods, a silent auction and more. It is definitely an event the entire family can enjoy! The Sister Bay Fall Festival is celebrating its 70th anniversary this year on the weekend of Oct. 16-18. 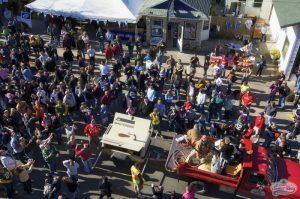 Called the “Granddaddy” of all Door County festivals, the Fall Festival features a car show, parade, an arts and crafts fair, food booths, live entertainment and children’s activities. The weekend also includes the Ping Pong Ball Shoot when 10,000 ping pongs are released and participants have a 1 in 10 chance of winning a prize from a local business. After spending the day looking at leaves, shopping or attending a fun festival, make time to relax and warm up in front of the fireplace in your suite at Bay Breeze Resort. We have 12 room types featuring queen and king size beds, garden and harbor views, Kohler rain showers and whirlpool tubs, and patios and balconies. This Ephraim WI lodging option also has its own private sand beach with upgraded, property wide Wi-Fi access and award-winning gardens. (Even though our outdoor pool and heated whirlpool close in mid-September, the beach is still open.) During the week, we charge off-season rates – another reason to check us out. For more information or to make reservations for a unique Ephraim WI lodging experience and the best place to stay in Door County, contact Bay Breeze Resort at 920-854-9066 or email [email protected]. Our last night welcoming you this season is Saturday, October 31. We will reopen for another wonderful season on Thursday, April 28, 2016. We are here to take reservations over the phone and online all year-round. Stay tuned to our website for 2015 specials. We look forward to hosting you in Door County!